Prepare yourself, honey — the Fab Five are back! On March 15, Netflix’s hit reboot “Queer Eye” returned to screens with eight fresh episodes for its third season. With a new season comes new faces, new mascots and a new location as the Fab Five move on to Kansas City, Missouri, serving crisp looks that change lives. And trust me — you’ll want the tissues out and ready for this season. “Queer Eye,” like its predecessor show that ran from 2003-2007, “Queer Eye for the Straight Guy,” features five gay men, also known as the Fab Five — Jonathan Van Ness, the grooming expert; Tan France, the fashion expert; Antoni Porowski, the food expert; Bobby Berk, the design expert and Karamo Brown, the culture expert — as they give entire life makeovers to deserving people across rural America. While these five experts can work their magic on any transformation, it isn’t just superficial; the Fab Five aim to help inspire change on the inside too. Throughout the episodes, they help people who struggle with self-confidence and identity by offering the person advice and tips to better their lives. In between dance montages, fashion tips and playful banter, the five help everyday people navigate family, community, self-care, gender, sexuality, race and insecurities. The ideas of masculinity and femininity are explored and blurred throughout each episode, as participants explore their own identity. In 2018, the show was nominated for four Emmy awards and won three, including the Emmy for Outstanding Structured Reality Program and Outstanding Casting for a Reality Program. 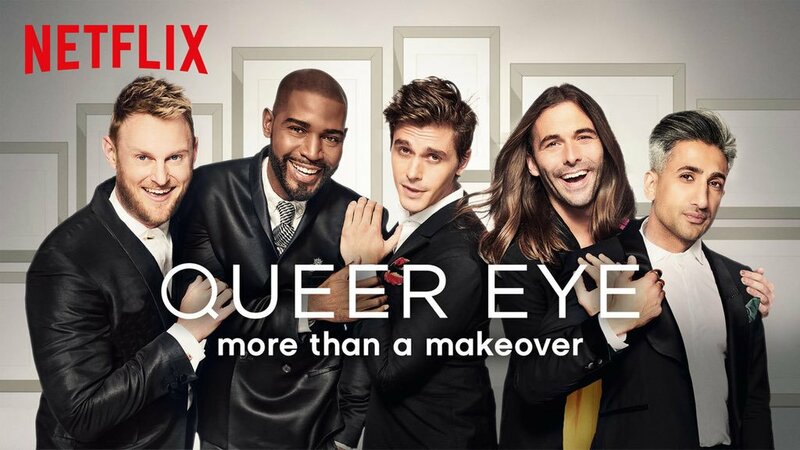 The name change from the original reflects the changing focus of the Netflix series; “Queer Eye” aims to help change the lives of all deserving people, regardless of gender and sexual orientation, leading to diverse contestants. In season three, people with various gender, sexual and racial identities become the best version of themselves. Season three may be the most diverse yet — it features an almost even split of male and female individuals, unlike the first two seasons which featured mostly men. It also features the first lesbian protagonist, Jess. The Fab Five help her find and embrace her identity as a “strong, black, lesbian woman” in the fifth episode of the season, “Black Girl Magic.” The episode easily touched viewers’ hearts and even prompted a response from singer-songwriter and actress Janelle Monáe. Another memorable episode of the season features the Jones sisters — two strong, independent female pitmasters in Kansas City. After the season premiere, business was booming in their BBQ restaurant — the sisters sold roughly 11,000 bottles of their secret sauce in the premiere weekend, bringing in roughly $76,890 in just a few days. Other episodes of the season feature the very first “Queer Eye” wedding, a man preparing for a brand new baby, a woman struggling to find her own definition of femininity, a widowed father and a 21st birthday. I’d be remiss not to mention the most important new addition to the show: Bruley, a French bulldog owned by producer Michelle Silva. Bruley’s adorable face quickly became the mascot for the Fab Five, enjoying the new Kansas City condo — and Porowski’s delicious cooking. “Queer Eye” is also gearing up to release a four-episode special — “Queer Eye: We’re in Japan!” — where the Fab Five will travel to Tokyo to spread their lessons of self-care and love with four Japanese men and women, as well as explore the local culture. All audiences will be able to find something that resonates with them. Whether it’s house design tips, food recipes, grooming hints, fashion advice or those wholesome, tearjerker moments that only Brown can provide, “Queer Eye” and the Fab Five have a special way of reaching out to viewers of all walks of life. So clear your schedule, stockpile the tissues and get ready for the feel-good binge session of the season.